A national Youth Service Corps member, Adedayo Aderemi at the weekend won the maiden Reindeer Month Grand Finale Trolley Dash organised by SportyBet Nigeria in collaboration with Spar Nigeria. The event, a five-week contest, featured participants who liked the SportyBet brand on social media and then tagged two to three of their friends to qualify for a lucky dip that gave the winner the opportunity to partake in a super trolley dash. The super trolley dash offered the winner an opportunity to pick various items of his choice, including LED TV, Home Theatre, Gas Cooker, Washing Machine, Portable Refrigerator, Air Conditioner Unit, and many others under 300 seconds at the Spar Nigeria shopping mall in Lekki. An elated Aderemi, a Mechanical Engineer, expressed joy at the opportunity to pick items that would eventually change his lifestyle under five minutes. “Sincere appreciation goes to the board of SportyBet Nigeria. I am grateful for the privilege I had as the winner of the SportyBet Reindeer Month Trolley Dash. I really appreciate. “I was expecting to get just a gift, but I got more than I bargained for. Thank you very much. Get Sporty, Bet Sporty,” he said. Also speaking at the occasion, the Marketing Manager of SportyBet Nigeria, Mr. Odiri Eboh said the essence of the campaign was to give back to the community, which has given so much to the firm. “For this campaign, we decided to partner with Spar Nigeria, which is one of the biggest shopping outlets in Nigeria. We wanted something that will give us publicity, the opportunity to leverage on the existing structure of the brand. We hope to have the campaigns every month in 2019 to entice and excite our users,” he said. Spar Nigeria’s Marketing Manager, Mr. Emmanuel Isanediok said the outlet had always been associated with good ideas, hence the collaboration with SportyBet. 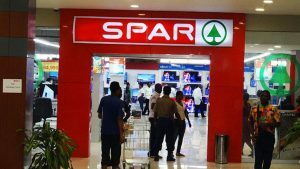 “Our slogan is living life better, which is why Spar Nigeria is encouraging people to live their lives better. SportyBet does it physically, which is sport, why we do it in terms of what people eat. What we give actually nurtures the body and we encourage people to live a healthy lifestyle,” he stated.